Queens' is amongst the oldest and largest of Cambridge’s University Colleges. It was founded in 1448 by Margaret of Anjou,the Queen of Henry VI, and refounded in 1465 by Elizabeth Woodville, the Queen of Edward IV. The college is built on the lands of the former St Bernard's College hence the full name of the college - "The Queen's College of St Margaret and St Bernard, commonly called Queens' College, in the University of Cambridge"
The façade facing onto Queens’ Lane contains Old Court, Walnut Tree Court and the Chapel which was designed by George Frederick Bodley. 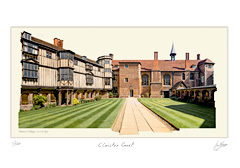 The Cloister walks were erected in the 1490’s to connect the Old Court with the riverside buildings of the 1460’s to form a new Court. President's Lodge in Cloister Court is the oldest building on the river at Cambridge. The Mathematical Bridge, which is officially named the Wooden Bridge, crosses the River Cam and connects the older half of the college with the newer, western half. The bridge was built of oak in 1749 by James Essex the Younger to the design of the master carpenter William Etheridge. It was completely rebuilt in 1905 to the same design except made from teak, and the walkway was made sloped for wheelchair access. A handrail was added on one side to assist the Queen Mother crossing the bridge on her visits to the college.